Marks/Label: Stamped inside boot: H.C. Barnaby & Sons, Bridgewater, N.S. Boots were given to the donor by a friend 20 to 30 years ago. Believed they purchased them from an antique store in Nova Scotia. Originally sold by H.C. Barnanby & Sons, Bridgewater, N.S. The H. C. Barnaby & Sons business operated on King Street, Bridgewater, near the former post office building. Established in 1879 by H.C. Barnaby, he operated a well-stocked general store, selling everything from flour, meal, feed, groceries, boots and shoes, dry goods, hardware, lumber, etc. In 1897, H.C. Barnaby brought his son Arthur C. Barnaby into the business as co-partner. Unfortunately, the business was destroyed by the January 12, 1899 fire and H.C. Barnaby was killed when struck by a horse and wagon while surveying the damage to his property. A. C. Barnaby and the Barnaby brothers worked hard to get the business back up and running, and by September of 1899, they had moved into their new quarters on King Street in the same location as their former store. In 1901, the firm became H.C. Barnaby & Sons when Howard S. Barnaby, a younger son of the founder, became a partner. In the McAlpine’s 1914 Directory for Bridgewater, the business was advertising general merchandise, staple and fancy groceries and company supplies was a specialty. When cars became popular they got the agency for selling Chevs and were not long developing a car business and dropping the grocery business. Taking over the former Charles Bent store across the street, former Barnaby store clerk J. Irving Hebb bought the business, and changed the name to Hebb Motors. Barnaby’s also had a separate building for running the shoe business and Gordon Leaman took this over from the Barnaby’s, eventually running the store as Leaman’s Shoes. Barnaby’s son, A. C. Barnaby went on to serve as mayor of Bridgewater from 1920-21. 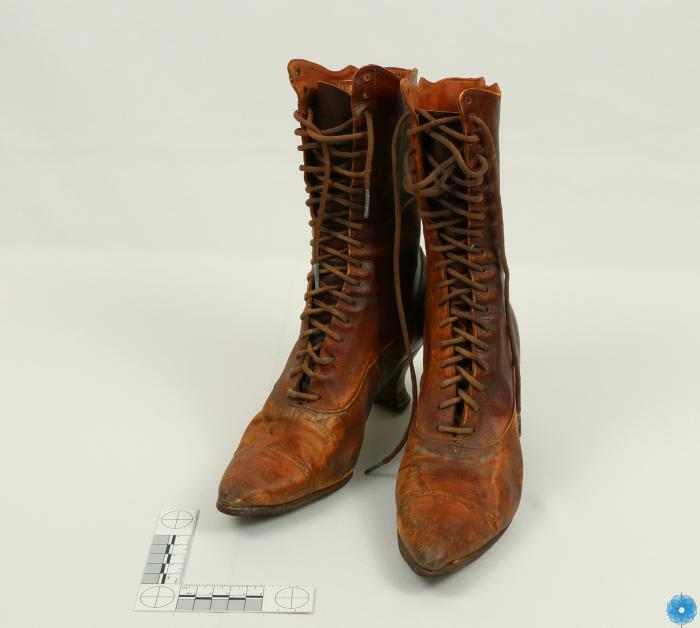 Description: Pair of ladies brown leather boots with a 6 cm stacked heel, pointed toe with an embossed design and a 0.4 cm wide band of design across the top of the toe. There are 18 pairs of eyelets and brown shoe laces. The top of the boot has a decorative top stitched edge. The inside has a cotton lining and is stamped 4506249915 on the right boot. The same numbers are stamped on the lining of the left book. Stamped in gold lettering on the inside of the leather upper part of the right boot is H.C. Barnaby & Sons, Bridgewater, N.S. History of Use: Worn on a woman's foot to keep her foot dry when walking.